If guests are no show up or Cancellation two days before we are charge one night each room. The following group types are not accepted by this hostel: College / University, Business Trip, Stag/Hen/Bachelor Party, Sports Group If you have misrepresented the type of group you are booking for, your booking may be cancelled by the hostel." 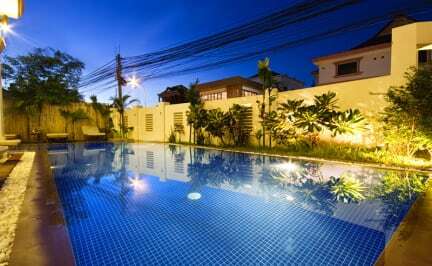 The KING BOUTIQUE HOTEL is the best place to stay, it located in the heart of Siem Reap town where only 5 minute walk to Old Market and Pub Street. The building is new with balcony in front. Some rooms are decorated with khmer style art. We have restaurant, internet access, package tour and travel agent at the ground. Our rooms are cleanly decorated by the structural Khmer Art with a pleasant atmosphere in a large size with big window, private bathroom, balcony (front). We have 20 rooms available which are listed under two different categories. Children under 6 who share a bed with their parents stay free. Our large rooms are cleanly decorated by the structural Khmer art with a pleasant atmosphere. They all have big windows, a private bathroom, balcony (front).